US Rep. Marcy Kaptur (D-OH) is talking to Bill Moyers about the state of the economy. She claims it's a "Financial Coup D'Etat"
It's a lengthy interview, about 20 minutes, but well worth a listen in entirety. The site has a complete transcript for those with limited time. Here is a partial transcript. MICHAEL MOORE: We're here to get the money back for the American People. Do you think it's too harsh to call what has happened here a coup d'état? A financial coup d'état? MARCY KAPTUR: That's, no. Because I think that's what's happened. Um, a financial coup d'état? BILL MOYERS: That's the progressive Representative from Ohio, Marcy Kaptur, she's with me now. She has a Masters from the University of Michigan, did graduate study at M.I.T. and still lives in the same house in the Toledo working class neighborhood where she grew up. She's in her 14th term in Congress, the longest-serving Democratic woman in the history of the House, and she's an outspoken financial watchdog on three important Committees: Appropriations, Budget and Oversight and Government Reform. Also with me is a familiar face to viewers of this broadcast. Simon Johnson is the former Chief Economist at the International Monetary Fund. He now teaches Global Economics and Management at M.I.T. 's Sloan School of Management. He's one of the founders of the website Baselinescenario.com. I check it out daily for Simon's take on the economic and financial crisis. It's been a year since the great collapse and both my guests are well equipped to assess what's happened since then. Welcome to you both. Others have posted the link already but I wanted to get in a few comments. 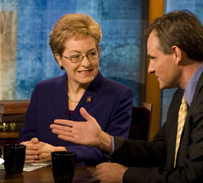 At left: Congresswoman Marcy Kaptur with Simon Johnson, the former Chief Economist at the International Monetary Fund. The interview with Bill Moyers is an early sign that people are shifting their attitudes significantly. Kaptur does not look like or sound like some radical nutcase, yet she presents a compelling case of a Financial Coup D'Etat. Two years ago people would have laughed at the idea. Not today. This type of sentiment is a good portion of what is powering (and going to power in the future) the gold bull market this time around. There is not so much fear of inflation or deflation, rather there is a growing loss of faith in the financial system and government itself, not just in the US but a loss of faith in governments worldwide. The US just happens to be leading the way at the moment. Another clear sign of mistrust is the overwhelming support for Ron Paul's Audit The Fed Legislation, now with 301 co-sponsors per RonPaul.Com. Once again, a few years ago, people thought Paul's idea was loony. What Did We Get For The Trillions Of Dollars Spent? Sadly, for all the $1.4 Trillion expansion in the Fed's balance sheet, the $1+ trillion in various stimulus programs, and monetary printing, the economy has nothing to show for it other than a stock market rally. [Note: I had a typo leaving out the decimal point. The above sentence was revised from $14T to $1.4T. The Fed's Balance sheet was about $2.2 trillion at the time. "In all, the Fed more than doubled the size of its balance sheet, to $2.3 trillion." Please see H.4.1 Statistical Release for current numbers. As of October 15, securities held outright are up over $1.1 Trillion (not $1.4 Trillion) over a year ago but with more Mortgage Backed Securities coming. The wealthy have been bailed out, while the middle class and poor are stuck without a job in underwater mortgages, hoping for scraps of mortgage payment reductions when many would be better off walking away. Meanwhile boomers are headed into retirement, underfunded and scared half to death. I have been exchanging emails with John Mauldin on the growing list of problems as well as possible solutions (Please see Thoughts on the Economy: Problems and Solutions). This week, John will have another Thoughts From The Frontline on the unsustainable path we are on. Be sure to look for it. The title will surprise long-time Mauldin readers. Did Gold Bulls Hop Off The Train? Gold is up again making new highs. Interestingly, there has been little fanfare on this move. When gold broke 1000 in 2007, talk was "next stop 2000, then 5000". Sentiment was so extreme I was sure the next move was down. I am hearing very little of that type of sentiment now. Did the gold bulls hop off the train? That's what it seems like. If so, this move could have a lot more left in it, regardless of what the dollar does.